Dont touch my pancakes mommy!! 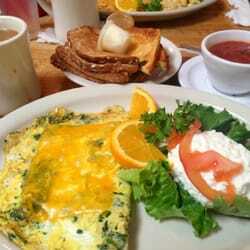 Voted Best Breakfast for the Monterey Bay. - Best Breakfast for over 10 years!Our service staff is trained to work as a team in order to better serve you. You'll often find more than one wait-person attending your table. When any item is ready, the closest available person will serve you. If you have a question, a concern, or simply need additional help, just ask anyone! Any member of our service team will be happy to assist you! Please let us know if you have any special dietary concerns; our staff will be glad to customize any order for you. To all our local patrons who have been with us through the years. You have seen our business and family grow. Because of you, Old Monterey Cafe has become the success that it is today! Thank you for your smiles, patronage, and patience through all the years. We could not have done it without you. The Old Monterey Cafe Staff.